Indoor Clothes Line Can Save The Day! 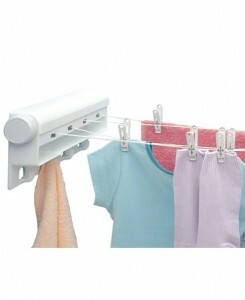 * Hang clothes in an area that is out of the way so you can close the door and open a window. If you don’t have a separate room make use of your bathroom which can be perfect for this – making use of an Indoor Retractable Clothes Line, over your bath is great for indoor drying – open the window and shut the door! * If you’ve been leaving clothes drying without any ventilation you may start to notice a problem with an excess of moisture in your home, which is why it’s so important to dry clothes in an area closed off from the rest of the home and with a window open to allow the moisture (coming off the drying clothes) to leave. If left unchecked you may start to notice mould… of course many homes will notice this when not allowing condensation to escape after having a bath or shower. One simple and effective solution is to make use of Condensation Removers placed in troublesome areas…. certainly bathrooms and areas where clothes will be left to dry.